This folding platform hand truck can expand quickly and easily from 20 inches to 28 inches, and then just as easily can fold down to roughly the size of a briefcase. It has protected corners covered in vinyl, and offers easy portability and storability. It has an aluminum frame that is both strong and lightweight; this tough 19lb hand truck can carry up to 300lbs. Its 4” wheels—two swivel and 2 rigid—are non-marking and promise an easy and smooth ride. 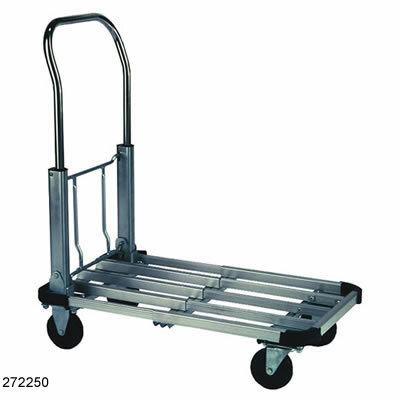 Let this platform hand truck take care of all your home or office moving needs. Don’t carry stuff when you can load up this hand truck and take it with you up the ramp or the elevator or across the room! 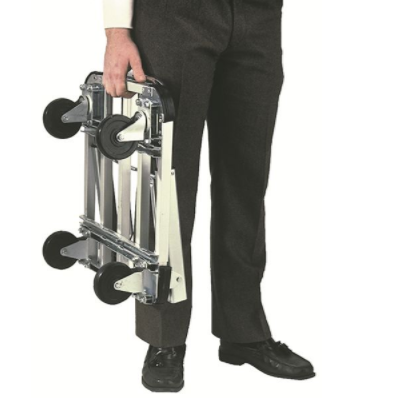 Click here to see another great professional folding hand truck option. 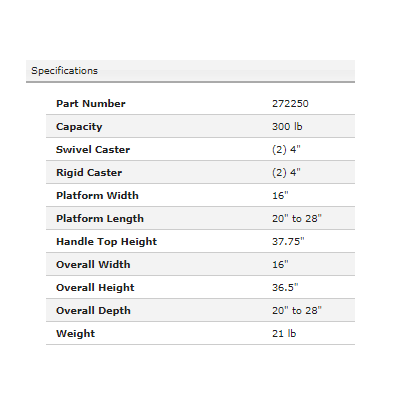 Look through all the dolly platform trucks we offer. Expandable platform 16" x 20" to 16" x 28"
Disadvantages: Does not come with tie downs.